Description Riders in the Tour of California cross Bixby Bridge as they move south along Pacific Coast Highway towards Big Sur. I shoot professional and local (Northern California) cycling events. 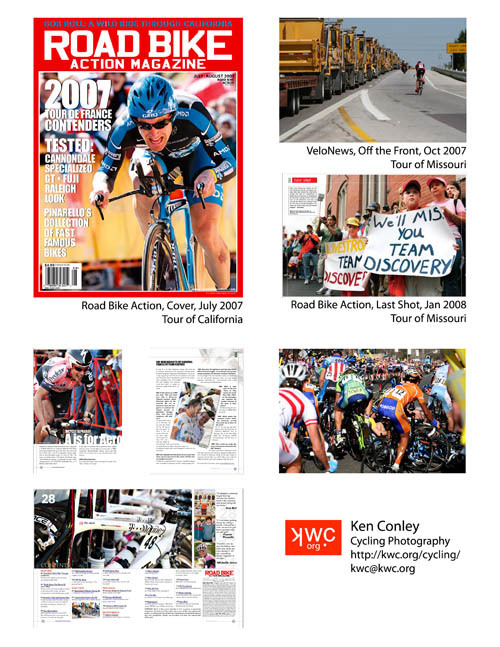 My work has appeared in VeloNews (two-page "Off the Front" spread) and Road Bike Action (multiple issues, including cover of issue 2). In 2007 I photographed the Tour of California, Tour of Missouri, Sea Otter Classic, and 24 Hours of Adrenalin World Championships. In 2008 I planning on shooting the Tour of California and possibly both the Tour de Georgia and Tour of Missouri. I have many photos of elite cyclists such as Levi Leipheimer, Alberto Contador, Dave Zabriskie, George Hincapie, and more. The images you see here have been proofed by me for printing. I have many more photos in my Flickr Cycling gallery. If you see any that you like, feel free to contact me and I can create a print-friendly version.